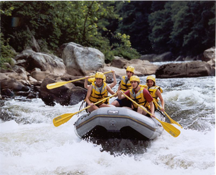 White water rafting. Photo courtesy U.S. NASA Goddard Space Flight Center. Most teams solve problems, and that means working together in meetings. We meet in conference rooms, in hallways, at copiers, in cafeterias, at vending machines, by telephone, in virtual meeting spaces, on airplanes, and even washrooms (though washroom meetings are vastly over-rated). Working together, we can sometimes forget that we're all people, and that we have a common objective — solving the problem. Here are nine guidelines that might help us all to remember that when we work together to solve problems, we are all still people. You're more likely to be open to new ideas if you accept that your understanding is incomplete. At any point, it's safest to assume that some subtleties have escaped you. See "Problem Defining and Problem Solving," Point Lookout for August 3, 2005, for more. How you look to others doesn't matter much, because the few who do keep score are mostly counting their own chips, not yours. They do compare themselves to how they see you, but you can't control how they see you. And your perception of your own status is probably way off, too. Waiting for permission or space to participate doesn't work. If you have a worthwhile contribution, make it available. But remember — no elbows. See "What to Do About Organizational Procrastination" for more. When teams engage, and some people tend to dominate, they deprive the team of access to the contributions of others. Take responsibility for making space for everyone. See "Plopping," Point Lookout for October 22, 2003, for more. is incompletethe problem by trashing relationships is failure. Preserving relationships at the expense of solving the problem is also failure. See "If You Weren't So Wrong So Often, I'd Agree with You," Point Lookout for May 8, 2002, for more. When we work too hard, we tire. We can lose our creative edge. We can hurt one another. To recover creativity and humanity, refresh yourselves. Take breaks. Work in a variety of formats. See "The Shower Effect: Sudden Insights," Point Lookout for January 25, 2006, for more. A calm river can handle only so much water. Beyond that, you get white water. A little pressure does help the team, but more leads to conflict, errors, turnover, stress diseases, divorces, and other bad stuff. Usually, we have time for research, detailed discussion, and consensus decision-making. In emergencies, we don't. Time works against us. Have special procedures for "condition red." See "Declaring Condition Red," Point Lookout for August 22, 2001, for more. We're all different. We approach problems differently. We see things differently. Our differences ensure that we take all relevant factors into account, and that we try a variety of approaches to solving problems. Those differences are a source of great strength. See "Appreciate Differences," Point Lookout for March 14, 2001, for more. Would you like to see your comments posted here? rbrenhkxqFRmMnoXcpkESner@ChacmJUjtmpPaVkkoLgZoCanyon.comSend me your comments by email, or by Web form. I offer email and telephone coaching at both corporate and individual rates. Contact Rick for details at rbrenMSBPbPijtmIilvpCner@ChacuZbDXeTwbFeGYiNYoCanyon.com or (650) 787-6475, or toll-free in the continental US at (866) 378-5470.